Dramatic low-care plantings are the reward for using regionally suitable plants that thrive in drier Western climates. After thirty years spent in Santa Fe, New Mexico in the retail garden center and greenhouse business, I've come to appreciate the plight of the Eastern Transplant (people that is, not plants). You could always spot folks from Chicago or Connecticut or Pennsylvania. We would find them wandering around the nursery yard or greenhouse with this bewildered "help me" look on their faces as they looked around, overwhelmed by the plant choices, few of which they even recognized. Here are some of the essential elements for gardening success when all you know is gardening in the Eastern or Mid-Western US. Mulch: It's dry here in the West! In a good year, Santa Fe gets about a foot of precipitation (rain and snow melt). So it is essential to protect the moisture in the soil from the wind and intense sunshine, which quickly steal moisture from the ground. Prepare the Soil: When I say "soil" I'm being very generous in describing that alkaline "concrete" we have to dig in. Even for native plants, it is essential to dig into the soil organic fertilizers like Yum Yum Mix and high quality compost to loosen it adequately for roots to grow into. These natural soil builders also inoculate the soil with life giving micro-organisms that are essential for plant health. And don't forget to add earthworms. They are especially helpful in loosening tight clay soils to facilitate root growth and good drainage. Inoculate with Mycorrhizal Fungus: Many water-wise (xeric) plants are able to grow in seemingly impossible conditions because their roots are growing with mycorrhizal fungi attached to them. These beneficial fungi help the roots to extract water and nutrients from the soil that roots alone can't utilize. The use of mycorrhizal root inoculants is especially important when you're planting into soils that have been damage and compacted by home or subdivision construction! Learn How to Harvest Rain Water onto your Landscape: We need to be sure to capture and use rainwater and snow melt as a supplemental source of water for our water-wise landscapes. Water harvesting can be a simple as taking the water from a rain gutter and using gravity to direct it to a tree or shrub planted near the house. Rain barrels should become a way of life for the western Gardener. Water Deeply and Less Frequently: Once established, many water-wise plants do best when watered deeply and less frequently (once every 5 to 10 days) . Roots follow the water down into the depths of the soil. Shallow, frequent water grows plants with shallow roots. You will train your plants to be less thirsty when practicing deep watering. Choose Regionally Suitable Plants: There are many annuals, perennials, shrubs and trees that actually thrive in difficult western growing conditions. that's why it is so important to learn about these plants and not just try and recreate what is familiar using plants that grew well where you used to live. Making regionally suitable plants available through a catalog was one of my primary objectives when I started High Country Gardens more than 20 years ago. 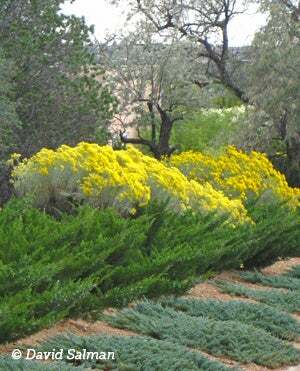 Western gardens have a dizzying array of native and Old World plants that do well out West. These are some gardening basics that will greatly improve gardening success in the West. Take the time to learn these new plants and understand these techniques to create a garden that is more self-sufficient, beautiful and low maintenance.